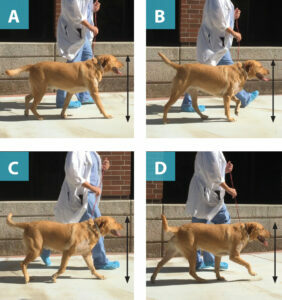 Have a veterinary nurse video record the patient’s gait with a smartphone. When an animal is presented to you with a history of lameness or a gait abnormality, you need to determine whether the problem is musculoskeletal, neurologic, or both, so you can recommend the appropriate treatment. To arrive at an appropriate diagnosis, you must collect the signalment and a thorough history, conduct a physical examination (including observation of the patient’s ambulation and direct palpation of the joints, extremities, and spine), and perform the appropriate diagnostic testing. This article reviews the clinical tools available to help you make the correct diagnosis and, consequently, make the best recommendations for treatment or referral. 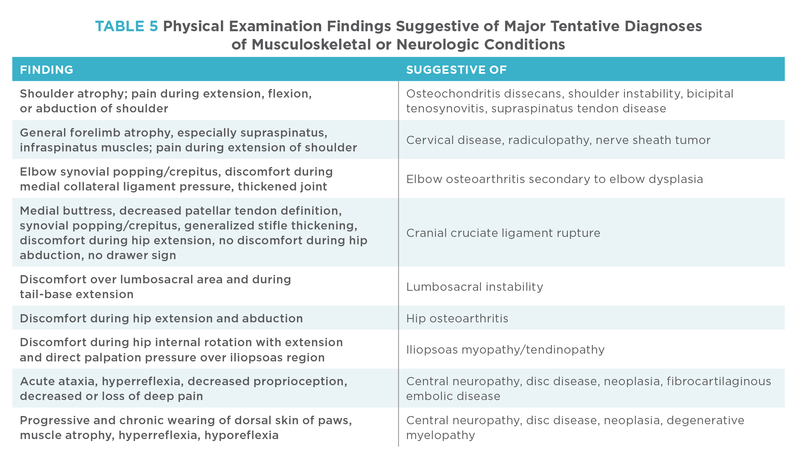 When taking a medical history, ask about any past trauma or orthopedic disease (e.g., fractures, hip dysplasia, cranial cruciate ligament rupture) or neurologic disease (e.g., disc disease, seizures, vestibular disease, behavior changes) (TABLE 2). 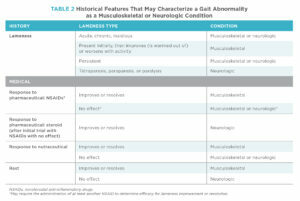 Although you should always ask about onset and duration of lameness or gait abnormality, be aware that musculoskeletal or neurologic conditions can be acute, subacute, or chronic. Current or previous responses to medications, such as changes in gait abnormality after administration of drugs (e.g., nonsteroidal anti-inflammatory drugs, glucosamine/chondroitin sulfate, or corticosteroids), also provide valuable information. 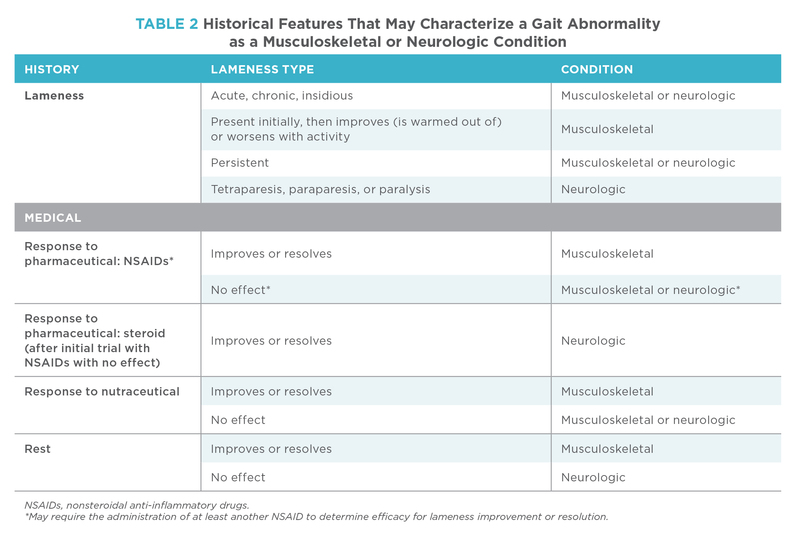 The historical character of the lameness or gait abnormality will also provide critical diagnostic information, such as lameness that worsens after activity or resting (musculoskeletal), a gait abnormality that is always present regardless of degree of rest or activity (musculoskeletal, neurologic), lameness that improves after mild exercise (i.e., “warms out of the lameness”; musculoskeletal), a gait abnormality that involves unilateral or bilateral limbs (musculoskeletal, neurologic), a gait abnormality that is visible in multiple limbs (musculoskeletal, neurologic), or lameness that seems to be weather-related (musculoskeletal). Consider the periodicity of the gait abnormality (intermittent or persistent) and whether the gait abnormality has been progressive or static over time. Although both musculoskeletal and neurologic conditions can cause intermittent or persistent gait abnormalities, determining the time course of the condition will help you prioritize the differential diagnoses for potential musculoskeletal and neurologic disease processes. Helpful Clinical Tip: In a busy practice setting, taking the time to obtain the signalment and details of the lameness history can seem daunting to the clinician, but having a veterinary nurse (versed in obtaining these critical data) do this for you can be a great time-saver and can provide essential information for piecing together the cause of the clinical gait abnormality. The clinical examination is performed in 2 parts: gait assessment and physical examination (which includes palpation and manipulation of the patient).1-4 As part of the clinical examination, you will need to localize the affected limb or joint, which can be accomplished by assessing gait (directly observing the patient’s ambulation) and directly palpating the patient’s joints, extremities, and spine. Although the gait assessment is routinely conducted before the direct physical examination, we have found that for patients with mild lameness or subtle gait abnormalities, reversing the order of the examinations (i.e., physical examination with palpations/manipulations followed by gait assessment) may allow for better recognition of a subtle gait abnormality. FIGURE 1. 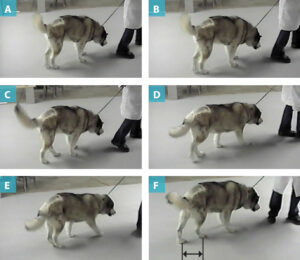 A 6-year-old, spayed female Alaskan malamute with cranial cruciate ligament rupture of the left stifle, shown at a walk. Left pelvic limb: late stance phase (A) and early swing phase (B). Right pelvic limb: late stance phase (D) and early swing phase (E). Because of discomfort/joint instability, the placement of the left (abnormal) pelvic limb foot in the midstance phase is shorter than that of the right pelvic limb foot when the right limb is in late stance phase (C) (compared with part A). The opposite is true when the right pelvic limb is in midstance phase compared with the left pelvic limb foot in late stance phase (F). This difference in foot placement is partially the result of discomfort/instability during weight-bearing on the affected limb, resulting in a shorter stance phase for the affected than for the unaffected limb during weight-bearing. 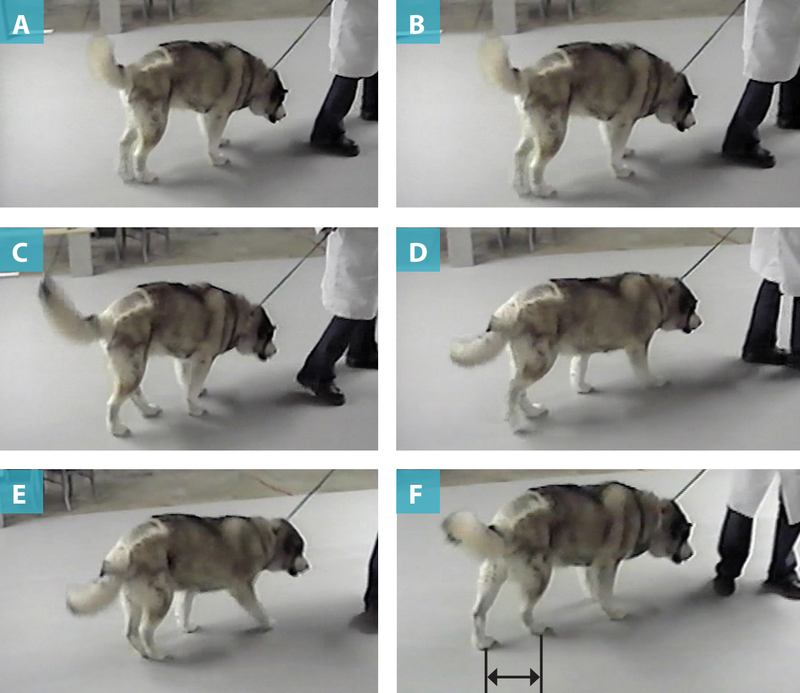 The observed effect is that the dog more quickly unloads the weight on the affected pelvic limb (shorter stance phase) than on the unaffected pelvic limb (longer stance phase). Arrows demonstrate the respective distances in foot placement. 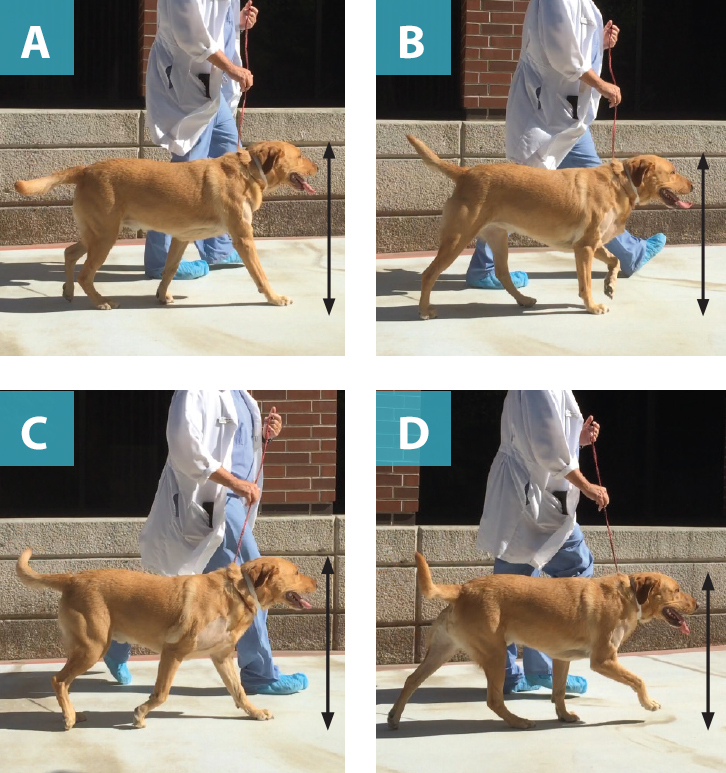 Gait is assessed with the patient standing, walking, and trotting. Besides observing the patient start, stop, and change pace, you should evaluate its gait from different profiles (right lateral, left lateral, cranial, caudal). Things to look for while assessing gait include variations in stride length, timing of foot contact, relative swing phase of limb/joint, lameness, ataxia (coordinated versus uncoordinated), head bobs, pelvic swings, circumducted swing phases, dynamic or static rotations (external or internal) of a limb, foot/nail scuffing, leg crossing (especially during turning), narrow stance in pelvic limbs, tail position, head/neck position, and hock and carpal position (palmar-grade/plantar-grade, dorsiflexion) (FIGURES 1 to 3). Click the full video of FIGURE 3 above. You should also evaluate whether the gait abnormality is coordinated (usually musculoskeletal conditions) or uncoordinated (usually neurologic conditions). Helpful Clinical Tip: Having a veterinary nurse or assistant video record the patient’s gait with a smartphone can be a significant time-saver. Many video functions allow for slow-motion playback, which can help you identify the affected limb and/or joint. The video should capture the animal’s right and left lateral, cranial, and caudal profiles at the walk and trot and should be made in areas with good lighting and on surfaces with good traction for the patient. FIGURE 2. A 3-year-old spayed female yellow Labrador retriever with nonmineralized supraspinatus tendinopathy of the right shoulder, shown at a trot. (A, B) The head is transposed upward (head-bob up) upon weight-bearing on the affected right thoracic limb during the stance phase. Head movement upward dynamically unloads the affected limb during the stance phase to reduce discomfort during weight-bearing. (C, D) The head is lowered to a neutral position upon weight-bearing on the unaffected left thoracic limb. Vertical black arrows on the frames and horizontal lines on the wall are reference points for head position during the gait cycle. During the physical examination (palpation and manipulation), initially the patient is standing and the examination is performed head to tail, or tail to head. The examination should include cervical manipulation (dorsal, ventral, lateral flexion); direct digital pressure over the cervical, thoracic, lumbar, and lumbosacral spine; and assessment of limb symmetry, including muscle atrophy and joint effusion (TABLE 3). Observe the stance and position of each limb, assessing for angulation (valgus, varus, external rotation, internal rotation). During palpation, pay careful attention to any swellings of the joints, muscles, or long bones (firm or soft swellings). It is critical that you evaluate conscious proprioception in all 4 limbs while the patient is standing. After you have examined the standing patient, perform palpation and manipulation with the patient in lateral recumbency (TABLE 4). Begin your examination at the distal aspect of the limb and proceed proximally. Check the plantar/palmar foot surfaces for evidence of corns, foreign material, abscesses, and irregular wear patterns of the nails. Next, assess the range of motion (flexion, extension, adduction, abduction) of all joints while isolating joint motion. During the range-of-motion assessment, note any abnormal joint-based sounds or sensations and differentiate between synovial popping (a palpable light and subtle popping sensation during flexion and extension of a joint radiating through the joint capsule because of joint effusion) and crepitus (articular surface grating). 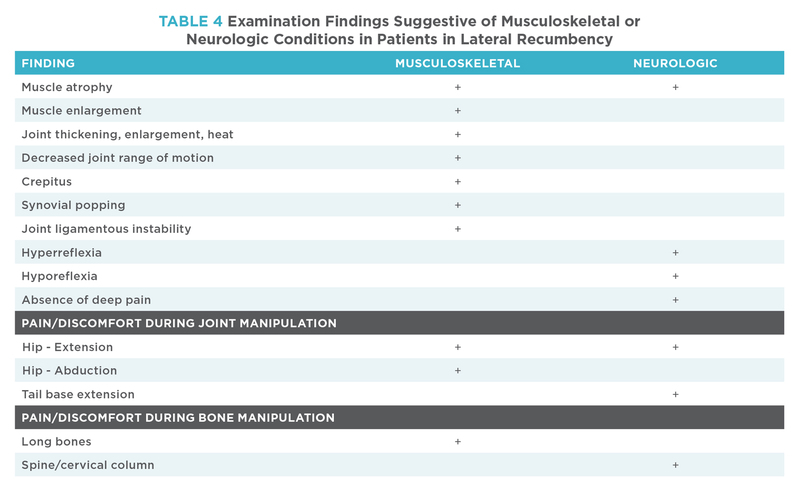 During joint manipulation, assess ligament-based stability by direct palpation, evaluating for things such as loss of collateral constraint or cranial drawer sign. Note any joint swelling/thickness, heat, or pain during manipulation. Differentiate between pain caused by direct digital pressure (e.g., direct pressure over the medial compartment of the elbow, over the biceps brachii tendon of origin at the intertubercular groove of the humerus) versus pain caused during flexion or extension of a joint. Lastly, evaluate myotactic reflexes and deep pain before progressing to the next limb. If possible, avoid sedation during this portion of the examination because it could influence the patient’s response to manipulations and palpations. Remember that deep pain is a conscious response to noxious stimuli and not just a reflex withdrawal of the limb. Helpful Clinical Tip: As a time-saver, if after assessing gait and while performing the physical examination you believe that the patient is affected by a musculoskeletal and not a neurologic condition, then you may not need to perform full myotactic reflex and deep pain assessments. However, for all patients for which you suspect a musculoskeletal condition, as a minimum neurologic assessment you should still test conscious proprioception reflexes. If deficits are detected, then consider performing more focused myotactic reflex assessments on the affected and contralateral limbs, evaluating epaxial muscle reflexes, and performing additional neurologic evaluations as necessary to localize the neurologic lesion. After you have performed a through physical examination and formed a list of differential diagnoses (TABLE 5), you can perform advanced diagnostic testing. Advanced diagnostics should confirm your tentative diagnosis of a musculoskeletal or neurologic condition, or both. Incomplete or no gait assessment performed. Incomplete musculoskeletal palpation of all 4 limbs, especially of what may be the affected limb/joint. Failure to radiograph the affected limb or joint, usually because of an incomplete physical examination and gait assessment. Not obtaining a complete history and character of the patient’s lameness or gait abnormality. Not following up soon enough after instituting treatment, which may delay consultation with or referral to a specialist. To be able to correctly discern between musculoskeletal and neurologic conditions, it is essential that you obtain a complete medical history and perform a clinical examination, which includes gait assessment and a complete physical examination, including palpation. Being aware of the qualitative differences in gait in a patient with a musculoskeletal (pain/discomfort, mechanical) or neurologic (weakness/ataxia) condition can help lead you to a correct diagnosis. 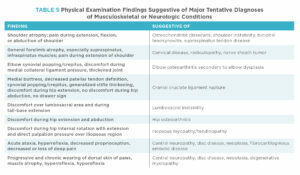 Advanced diagnostics should confirm your tentative diagnosis of a musculoskeletal or neurologic condition, or both. For patients for whom the distinction is not clear during initial evaluation, timely re-evaluations may be considered as needed. Consultation with a specialist can also help you arrive at the correct diagnosis for patients with musculoskeletal or neurologic conditions. DeCamp CE, Johnston SA, Dejardin LM, Schaefer SL. Orthopedic examination and diagnostic tools. In: Brinker, Piermattei, and Flo’s: Handbook of Small Animal Orthopedics and Fracture Management, 5th ed. Philadelphia: Elsevier; 2016:1-23. Fossum TW, Dewey CW, Johnson AL, et al. Fundamentals of orthopedic surgery and fracture management. In: Fossum TW, ed. Small Animal Surgery, 4th ed. Philadelphia: Elsevier; 2013:1033-1044. McDonnell JJ, Platt SR, Clayton LA. Neurologic conditions causing lameness in companion animals. Vet Clin North Am Small Anim Pract 2001;31(1):17-38. Lorenz MD, Coats JR, Kent C. Neurologic history, neuroanatomy, and neurologic examination. In: Handbook of Veterinary Neurology, 5th ed. Philadelphia: Elsevier; 2011:1-27. Powers MY, Martinez SA, Lincoln, JD, et al. Prevalence of cranial cruciate ligament rupture in a population of dogs with lameness previously attributed to hip dysplasia: 369 cases (1994-2003). JAVMA 2005;227(7):1443-1445.